When it comes to designing a transportation project, it's important to get accurate measurements of the landscape surrounding the project site. To accomplish this, PennDOT uses photogrammetry and LiDAR to create 3-D pictures of an area that our design units then use to map out a project's specifications. Photogrammetry is the use of overlapping photography — especially aerial photography — to create 3-D models. LiDAR, or light detection and ranging, involves emitting a laser pulse and collecting its reflected return up to a million times per second creating a cloud of 3-D points. LiDAR can be stationary, vehicle-mounted, or airborne. While LiDAR is more accurate than photogrammetry, it doesn't provide a description of the points collected. Photogrammetry, on the other hand, allows an operator to interpret the photos to see the features collected. Used together, they can provide a complete picture of an area. Vehicle-mounted LiDAR used at PennDOT is very useful on existing corridors, but photogrammetry is best used outside the corridor, especially in vegetated areas. Photogrammetry is very cost-effective when high accuracy is not required. Static LiDAR is for specialized projects, especially where safety concerns limit the use of other methods. Land surveyors use static LiDAR to capture specific smaller portions of roads, bridges, and rugged terrain. On both large and small projects, the use of these tools can greatly improve employee safety by eliminating the need for land surveyors to enter high traffic or difficult and dangerous areas. The use of vehicle-mounted LiDAR allows PennDOT to gather highly accurate roadway data without having lane closures which is necessary to gather roadway measurements using conventional field survey methods. A static LiDAR tripod takes measurements at the scene of a 2015 tractor-trailer crash and fire on an interchange bridge carrying Interstate 81 in Harrisburg. 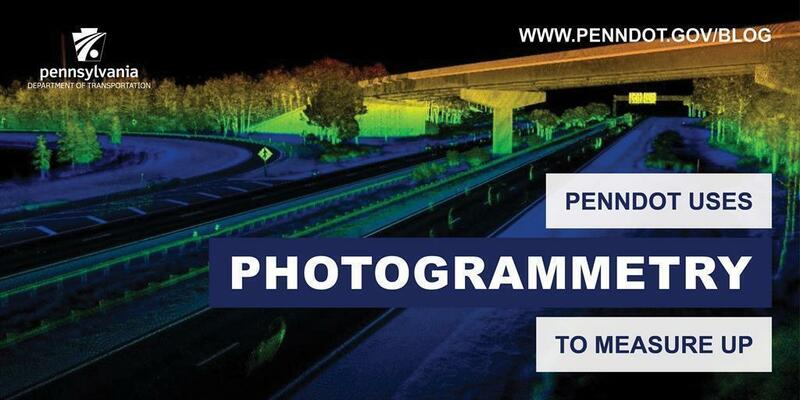 PennDOT's photogrammetry unit generally does more than a hundred projects a year. For instance, in 2015 after a tractor-trailer crash and fire destroyed an interchange bridge carrying Interstate 81 in Harrisburg, static LiDAR was used to determine the extent of warping to steel beams on the bridge that were directly above the fire. Mobile and static LiDAR methods were used on a project with high-traffic Fort Pitt and Squirrel Hill tunnels in Pittsburgh. By using LiDAR, the department closed the Fort Pitt Tunnel for just a few minutes, and the Squirrel Hill Tunnel had only one overnight single lane closure. A current project that used photogrammetry and previously plotted designs is the Potters Mills Gap Transportation Project in Centre County. Construction on the project began in 2015 with Phase One building a new bridge at Sand Mountain Road. Phase Two created the new local interchange on Route 322 at Sand Mountain Road, and the goal of Phase Three is to reconstruct Route 322 from Sand Mountain Road to Potters Mills, including a new Route 322/Route 144 intersection. The completed project will alleviate congestion and allow traffic to move more safely and efficiently from the Centre/Mifflin County line to Potters Mills.